It’s not for me to say whether Stephanie Borg has led a colourful life… but it’s probably quite accurate to say that colour does play a central role in her life and work. Add some interesting, sometimes rather unusual compositions, and some intricate patterns to the vivid colours and that’s Stephanie’s art. I think…Stephanie is a self-taught artist with a background in graphic design. In the past she has worked for a number of companies in this field. 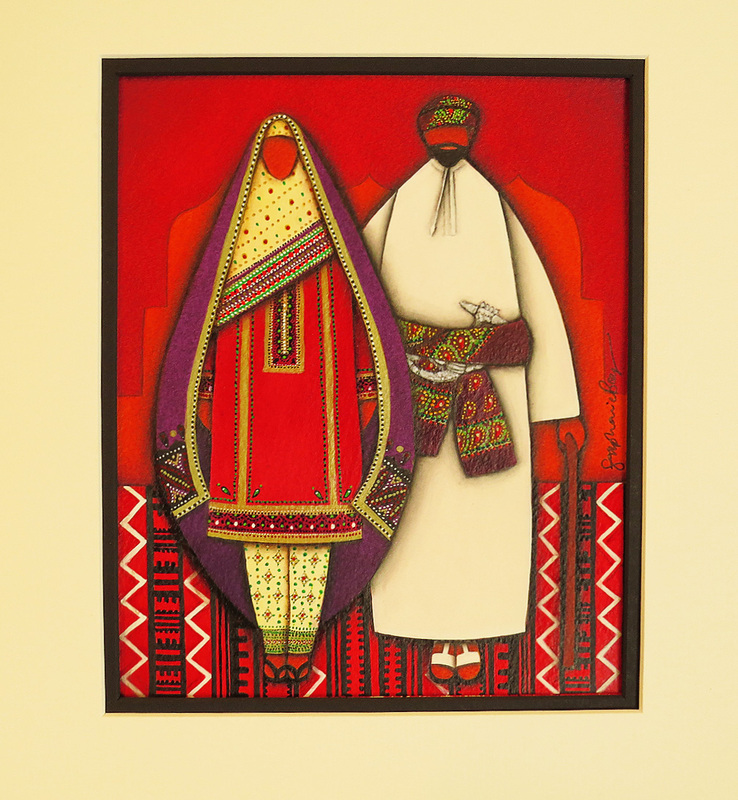 She has also lived, at times worked, in places as diverse as Italy, the Bahamas, Florida in the USA and perhaps most influentially in the Sultanate of Oman where she is still represented by an art gallery there. But then seven years ago she decided she’d had enough of graphic design and the nine-to-five life and took the leap to freelancing – never the easiest of decisions. 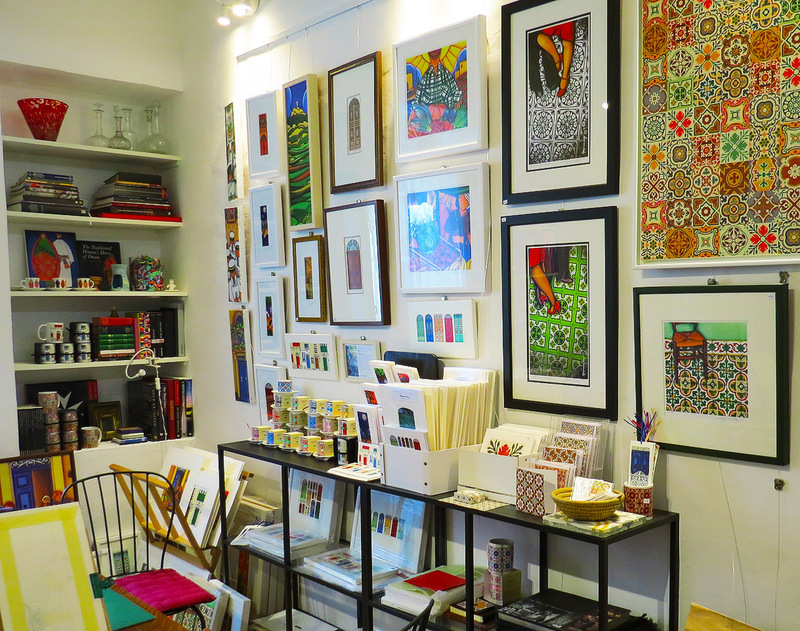 I meet Stephanie at her home/studio in a quiet area of Rabat and I immediately feel the warmth of what can best be described as a private shop chockful with wonderful stuff. 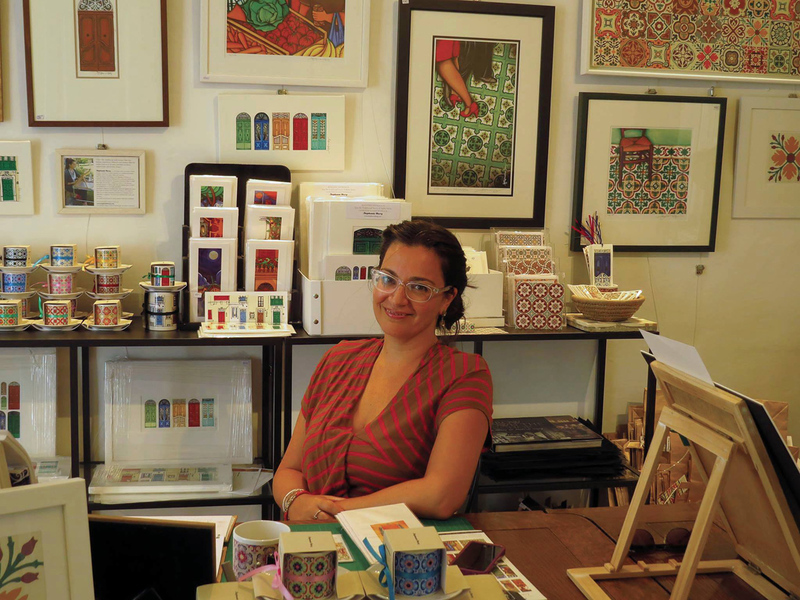 Here in this well-lit studio is her complete range of works: original paintings, limited edition prints, brightly patterned mugs and coasters and a stationery collection which includes cards, wrapping paper and gift tags. There’s also a love of local forms and patterns in Stephanie’s work. 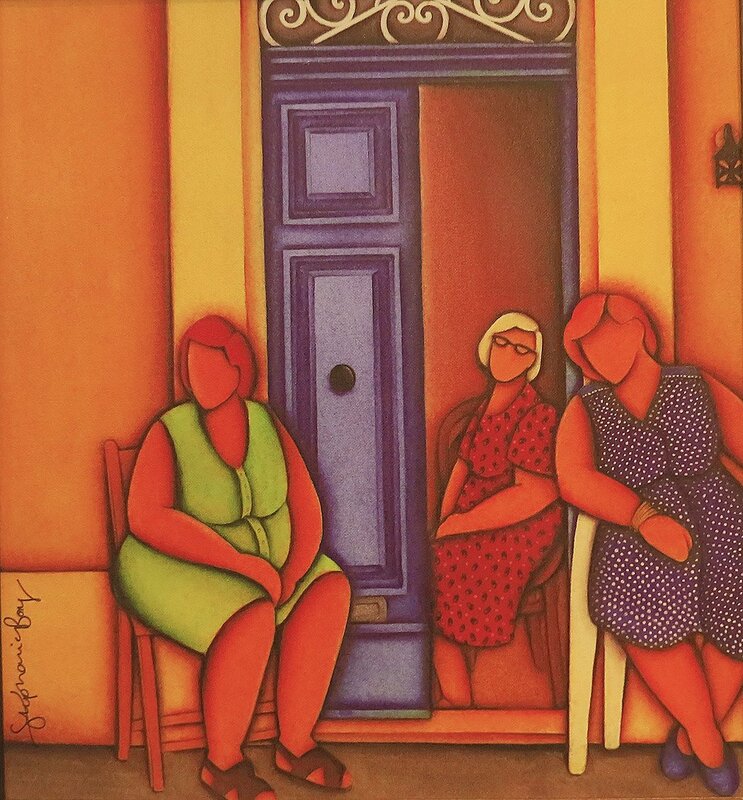 Traditional Maltese doors and floor tiles are a recurring theme in a number of works and I am surprised to learn that an ink drawing of a door can take up as much as some sixty hours of her time. But then this is flawless, quasi-graphic work – indeed a labour of love. Stephanie is a regular exhibitor in local artisan fairs – where I hazard to say her work stands out in terms of quality and original concepts. But if you miss these fairs on your Malta visit you can still find samples of her work available from the Spirit of Malta outlet at the departure lounge of Malta International Airport and other selected outlets. 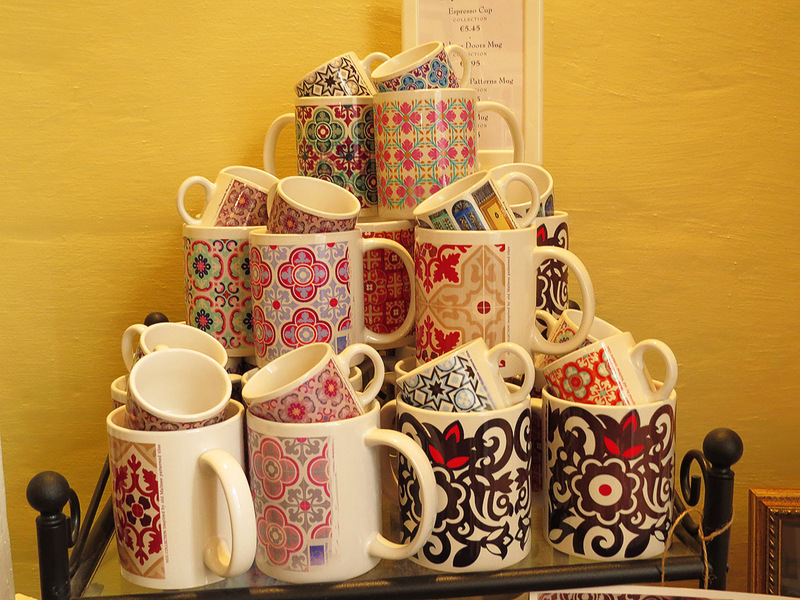 In addition to all this Stephanie sometimes organises open days at her studio at 33, St. Catherine Street in Rabat. If you are really keen on taking back a little piece of Malta with you, you can always inquire for an appointment to see Stephanie’s work close up – although Stephanie plans to have fixed open studio hours soon. Stephanie’s future plans (sensibly) include doing more of what she likes doing, expanding the range of her work as well as a general revamp of her website which will include online shopping facilities towards the end of November 2016.